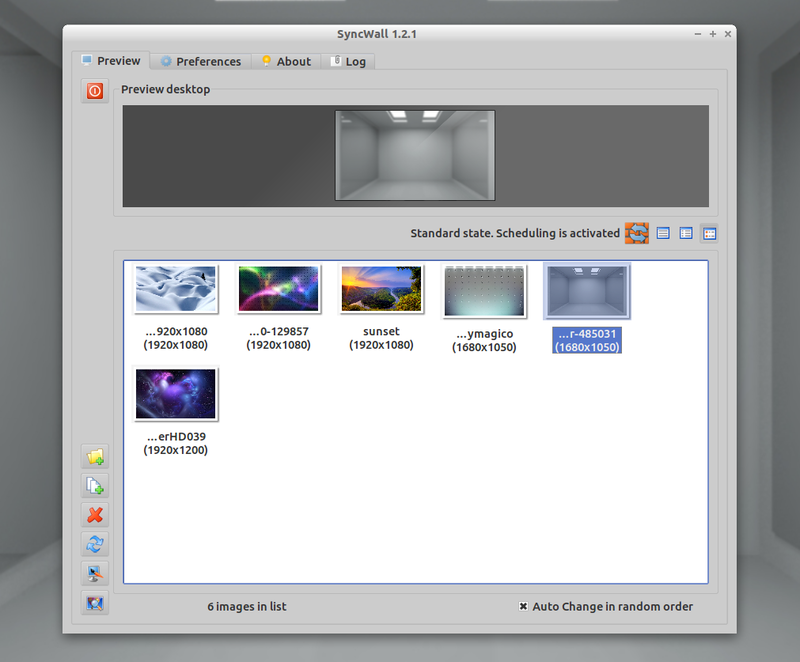 SyncWall is a cross-platform wallpaper change written in Qt which supports multiple monitors and wallpaper synchronization between workstations. 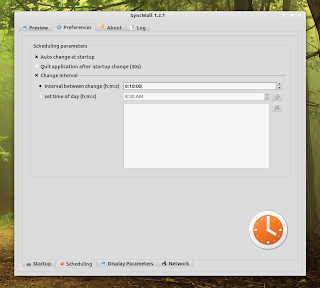 According to its official website, SyncWall supports GNOME / GNOME 3 (Unity included), LXDE, XFCE, KDE3, KDE4 and others. 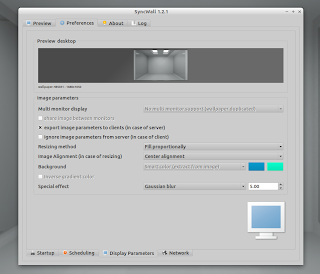 However, there's currently a bug that affects KDE4 users, but there's a work-around: you must manually select the image SyncWall generates under ~/.SyncWall in the plasma configuration and set it to "center" (this is only required the first time). To get the wallpaper synchronization to work between workstations, you must manually copy the wallpapers on each machine, under the same folder (same path). 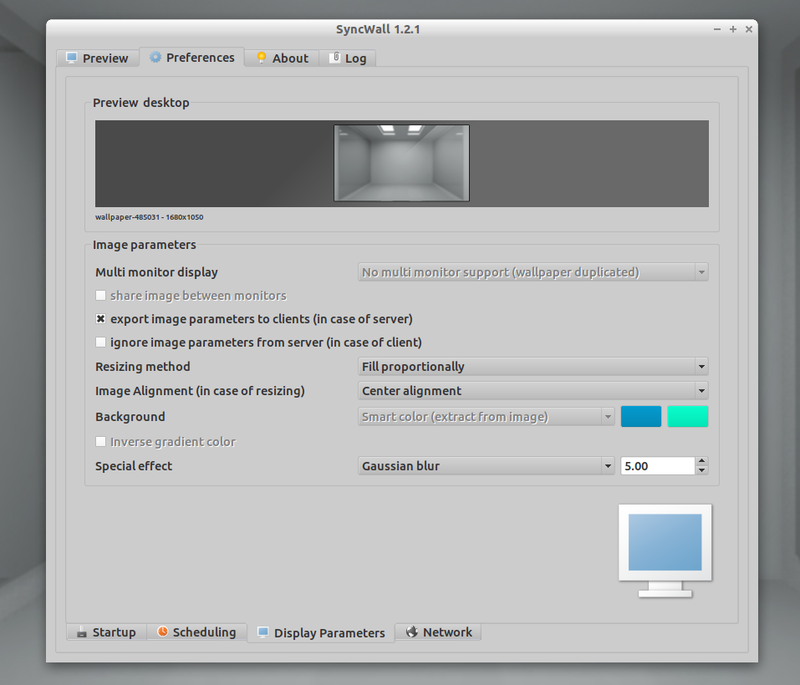 Then, in the SyncWall Preferences, click "Network", enable "Synchronize with server", enter the server IP and that's it. Please note that SyncWall tries to automatically detect the desktop environment, but this can fail sometimes. If the wallpaper doesn't change, manually select the desktop environment in the SyncWall Preferences, on the Startup tab. For Unity, select GNOME 3 as the DE. Because Ubuntu automatically creates an AppIndicator for all Qt applications that use a notification area icon, the original Syncwall package doesn't work properly under Ubuntu 11.10+ (with Unity): if you select to minimize it at startup, you can't activate the main window again unless you reset the SyncWall settings. To fix this, I've added a patch to the package available in the WebUpd8 PPA, so you can select "Show SyncWall" from the notification area / appindicator menu. To get SyncWall to start when you log in, search for "Startup Applications" in Dash / menu, click "Add", under Name enter "SyncWall" and under command: "syncwall". If you want SyncWall to start hidden (minimized, in the notification area), on the SyncWall Preferences tab, check the "Start in notification tray" box. For other Linux distributions and Windows, download the SyncWall from SourceForge.